This experimental design had a three-bladed rotor and torque was compensated for by a jet thrust arrangement at the end of the fuse-lage. The air from a multi-bladed fan which cooled the engine was ducted through the inside of the fuselage, heated by the exhaust gases and then ejected through an opening on the port side. Two hori-zontal shutters controlled the flow of this air. 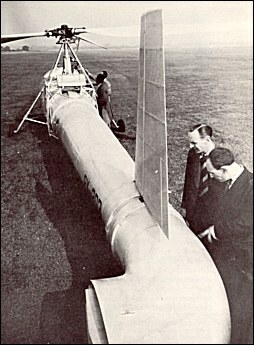 The controllable efflux was also used to impart turning movements to the rotorcraft, which had neither fin nor rudder. The multi-bladed variable-pitch fan was coupled to the rudder pedals and thus provided yawing control. The W.9 was an experimental helicopter with a three-blade main rotor. Torque compensation was achieved by a jet of air discharged from the port side of the rear fuselage and supplied by a fan which also cooled the engine. The jet was controlled by two vanes. Now I know where the MD Explorer came from!